At 5.0% the global contract logistics market grew at its fastest annual pace since 2010. While it has been a strong year overall in contract logistics, and the value LSPs deliver to shippers across the world has been demonstrated in the results for the market as a whole, there are undercurrents of profound change which require action now to make sure the trends become opportunities, not threats. For the first time, Ti has carried out a detailed study to determine the structure of logistics service revenues. Ti provides a framework for breaking down contract logistics revenues by transportation, warehousing and value-added services, and forecasts how the split of revenues between these services will change over the next five years. Another first in 2018 is the inclusion of contract logistics penetration rates globally, as well as in Asia Pacific, Europe and North America. Alongside Ti’s Global Contact Logistics Market Sizing, which in 2018 includes 5-year growth forecasts for the first time, there is also an analysis of growth dynamics in various manufacturing sectors, as well as retail and e-commerce. Ti’s Global Contract Logistics 2018 report investigates a diverse set of drivers within the contract logistics marketplace including macro trends like Brexit and the potential implications of renegotiations of NAFTA for LSPs serving North America’s supply chains. 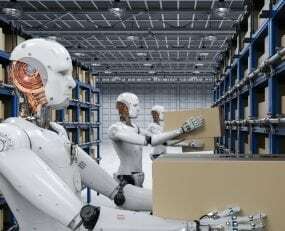 The report also takes a deep-dive into technological developments including Artificial Intelligence, autonomous vehicles, warehouse automation and blockchain. The report details what contract logistics providers have to gain from implementing the technology, and how the increasing sophistication and capabilities of the technologies may profoundly change the way shippers do business. This will create significant opportunities for those who can take advantage, and equally significant consequences for those lacking the agility and adaptability to keep up. “Technologies that have been creating buzz for a while are beginning to bear real fruit in terms of the real-world capabilities they offer. For LSPs, this means not only more change, but strategic and tactical threats and opportunities on the horizon. Artificial Intelligence, blockchain, autonomous vehicles and robotics, amongst others, offer vast opportunity to LSPs, but just as importantly, shippers stand to gain significant value if the potential of the technologies can be realised. Some shippers may do that themselves, but there’s a profound opportunity for logistics service providers to bring these capabilities in-house. It’s far from easy to do this, and will require deep strategic commitment form the highest levels, but the opportunities are too big to ignore.” Nick Bailey, Head of Research.